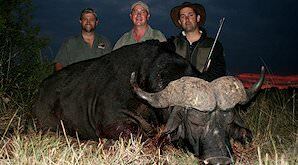 Big Five Hunting in the countries of South Africa and Zimbabwe accompanied by seasoned professional hunters. Of all of the game animals in Africa, none seem to capture the attention of the big game hunter quite like the Big Five. The elephant , Cape buffalo , lion , and leopard account for some of the most exciting and interesting big game hunting in all of Southern Africa. 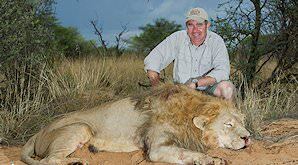 John Taylor, author of “Big Game and Big Game Rifles” and an Ivory Hunter in his own right, states clearly that when speaking of 'big game hunting on the African continent', we are speaking of hunting dangerous game. While many of the antelope species like kudu, wildebeest and eland can be quite large, none can turn the tables on the hunter so quickly and so completely as the members of the Big Five. 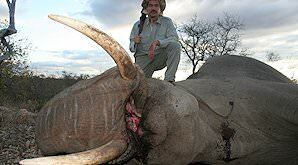 The resulting rush of adrenalin is the very essence of that which brings so many hunters to Africa. Except for the open plains of the Free State and much of East Africa, Africa's Big Five are hunted in semi-open scrub country. With the help of a competent Professional Hunter and a good stalk, most shots can be taken within 100 to 200 yards. The heavy, thick-skinned members of the Big Five are often taken at much closer ranges. 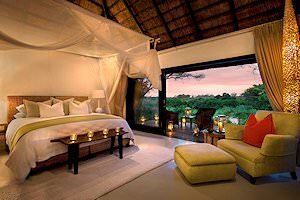 Most countries of Southern Africa specify the use of a rifle of at least .375 caliber or greater when hunting the Big Five. Except for the big cats, quality, controlled expansion bullets or solids are a must. For the soft-skinned cats, rapid expanding bullets are a better choice. In this regard, always trust the advice of your Professional Hunter. When deciding on the battery for your particular safari, consider the largest species you intend to take and plan accordingly. Make sure you are thoroughly familiar and comfortable with your weapon of choice. Keep in mind that, in all cases, it is much more important where your shot is placed than with what you have made the shot. So, while large caliber rifles with heavy-for-caliber bullets are the order of the day, don't overdo it! More buffaloes are hunted in Africa annually than any other member of the Big Five. 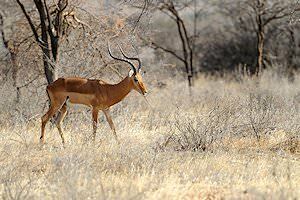 They are usually found in areas with densely wooded savanna where the shots can range anywhere from thirty to eighty meters. The winter months are the best time for buffalo hunting, as the leaves have fallen from most of the vegetation and they can be more easily spotted. We recommend booking your buffalo hunt between June and September. Elephant hunting requires a lot of walking. It is important to be physically prepared for this if your elephant hunt is to be successful. Shots on elephants are never long - it is necessary to get to within twenty to forty meters to make that all-important first shot. It is very important that the hunter be comfortable with his rifle when hunting any of the Big Five, especially so with elephant because of the close proximity to the animal when making the first shot. The leopard is the most elusive of the Big Five that can be hunted in Africa. Patience is key when hunting leopard. These cats are normally hunted over bait and will require you to spend many nights sitting quietly in a blind awaiting that brief opportunity when the leopard presents a good shot. 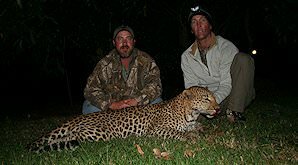 A successful leopard hunt is never a guarantee, but spending enough time in pursuit will most definitely increase the chances of a successful hunt. We recommend at least ten days, preferably fourteen. It is said that you hunt elephant with your feet, buffalo with your gut and lion with your heart. Legend further has it that a hunter is scared by a lion three times; the first time when its spoor is encountered, the second time when its mighty roar is heard and the third time when it is seen for the first time. Lion hunting is challenging, exciting and definitely one of the best African Big Five hunts on offer.